It gives lot of value to your dwelling if there are multiple sections installed to your outdoors for entertainments and fun! A patio is always a portion that is selected mostly to enjoy the pure open and natural climates and here we are with this DIY pallet patio renovation project that is just legendary in terms of DIY creativity! 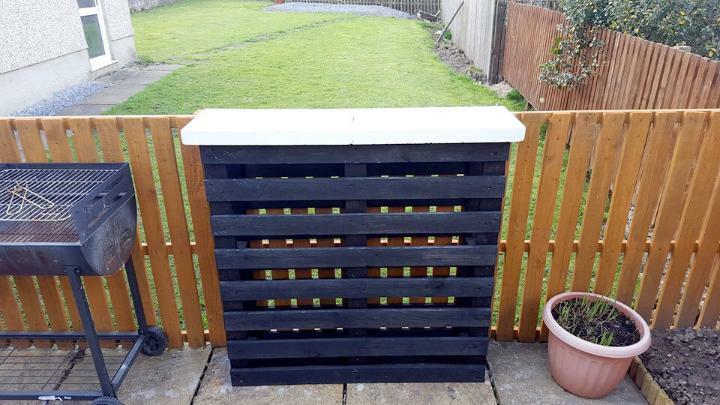 First thing you are to do to add a boundary wall or pallet fence around your selected patio area you are to use for fun, sitting and to ear morning breakfasts or night meals, just go with pallet fencing and install a security wooden wall around your patio first! Need to organize the BBQ feasting and beverage parties also at your patio, just get the wooden bar tables come with high tops and also the custom sitting and dining sets with pallets just like the given cool one dining set, well planned and well built with pallet skids only! These are all the great assets your patio should own to go for bigger entertainments there! 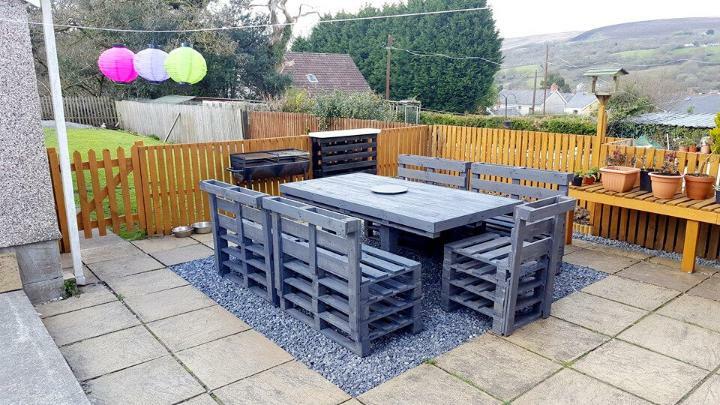 This pallet project would also be equally suitable to organize your pebbled outdoors, green garden spaces and also the raised home deck areas! Get all from pallet you need to set you patio furniture as an outlandish space! What makes you patio look divine? It is surely the pure weather, convenient sitting sets there and the colorful pots and greenery all around! 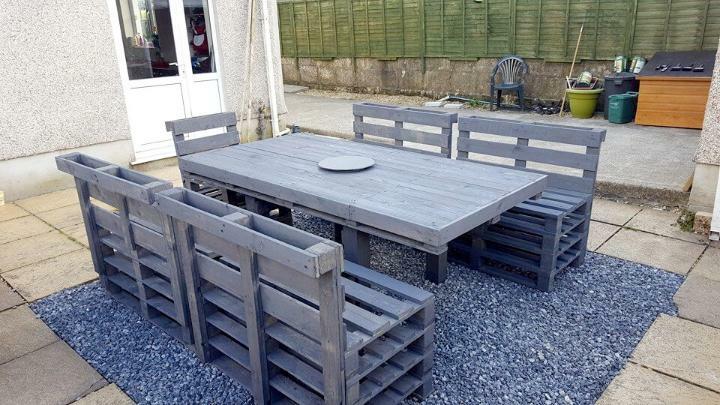 However, you can get now all the necessary furnishings for your patio for free using pallets! 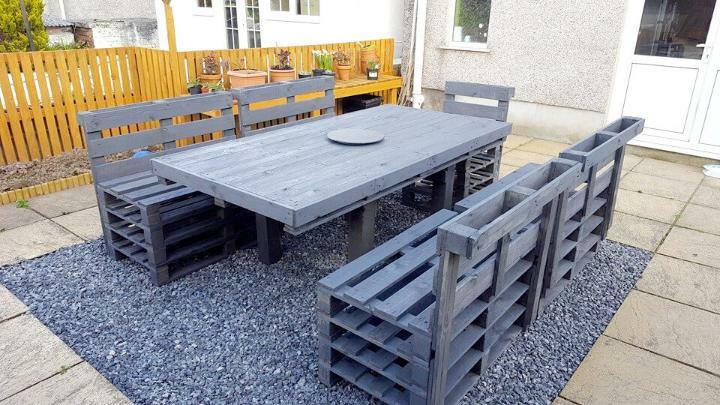 let the pallets lift up the mood of your patio, build this stunning grey painted pallet dining set first that also be awesome to organize outdoor conferences, beverage parties, dinners and also the BBQ feasting! Would rock on pebbled patio floors! A pallet board has been extended with a top and has been changed into a bat table to give your targeted patio a small beverage party space! Painted in white and black to look purely stunning! Small wood fencing has also been done around the patio area using pallets, pallets have been painted in yellow for a gorgeous appeal of fence! This is here a no-cost way to get your patio sensational and inspiring!